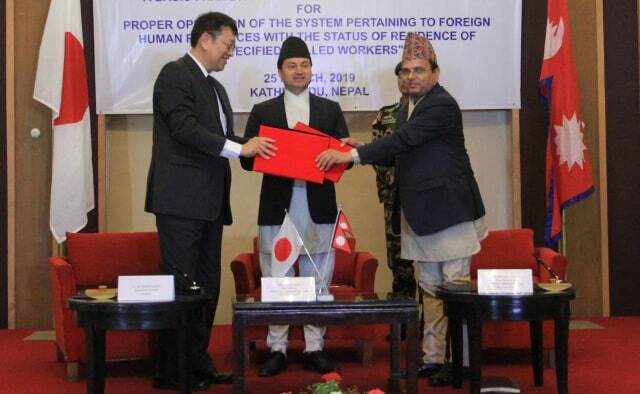 KATHMANDU, March 25 : Nepal and Japan on Monday signed a Memorandum of Cooperation (MoC) to send Nepali workers to Japan. Amid a function held at the Ministry of Labor, Employment and Social Security the government-to-government deal was signed by Officiating Secretary at the MoLESS Ram Prasad Ghimire and Japan’s ambassador to Nepal Masashi Ogawa. The MoC will come into force from April 1, 2019. As per the MoC, a separate unit will be established under the Department of Foreign Employment (DoFE) to facilitate the recruitment process of Nepali workers with the status of residence of SSW (Specified Skilled workers) including call for applicants, facilitate the Japanese side to conduct the language and skills tests and overseeing the deployment of the successful applicants to Japan. The joint committee with representatives from both sides has been established to ensure the proper implementation of the MoC and to take necessary corrective measures to improve the recruitment, employment and repatriation of Nepali workers with the status of residence of SSW, according to a press release issued by the ministry. 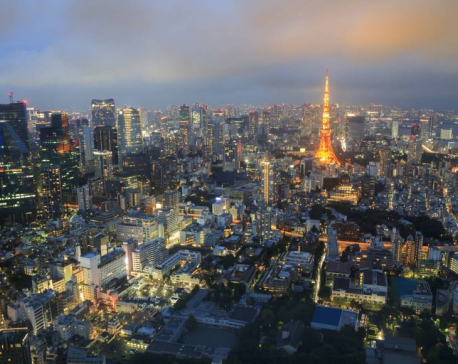 Beginning on April 1, 2019, Japan will accept foreign nationals in 14 sectors including agriculture, nursing care, automobile repair and maintenance, food service industry, construction industry, manufacture of food and beverages, accommodation industry, machine parts and tooling industries, fishery and aqua culture, industrial machinery, electronics and information industry, building cleaning management, ship building and aviation industry. While all the 14 sectors are open to Nepali workers, the number of workers to be accepted by sector has yet to be decided, according to the statement. Under SSW 1, workers will engage in work, requiring skills which need a considerable knowledge or experience and will be allowed to stay for a maximum cumulative period of five years. Under SSW 2, workers will engage in work requiring expert level skills and the extension of period of stay is possible. According to the ministry, family members will be allowed to accompany workers under SSW 2 category. "Equality of treatment between Nepali and Japanese workers will also be ensured in their terms of employment and in accordance with the Japanese laws. Remuneration received by Nepali workers with the status of residence of SSW will be equal to or more than the amount of Japanese national would receive for the same work," read the statement. Each worker will be supported by an external support plan which details services such as orientation to daily life in Japan, support to learn Japanese language as well as consultation and complaints handling regarding labor and living, according to the statement. An aspiring migrant worker must acquire N-4 language competency and have skills. While Nepal had made several attempts to ink a G2G agreement with Japan, it wasn’t possible until this year when a four-member Japanese government technical team arrived in Kathmandu on January 15 to hold extensive discussions regarding a bilateral labor agreement between the two countries. On December 2018, Japan’s cabinet had agreed to bring about 345,000 foreign workers from nine countries in 14 industrial sectors, including manufacturing, agriculture and fishing, nursing care, janitorial work, the hotel industry, as well as food processing and food services. The workers include those from Nepal, China, Indonesia, Mongolia, Myanmar, Thailand, the Philippines and Vietnam.